If you’re a client who’s new to cloud communications, you may have missed some of the key features that make the platform so powerful. One of the bread-and-butter features of the UnitedCloud platform is Answering Rules. We’ll cover it quickly here. 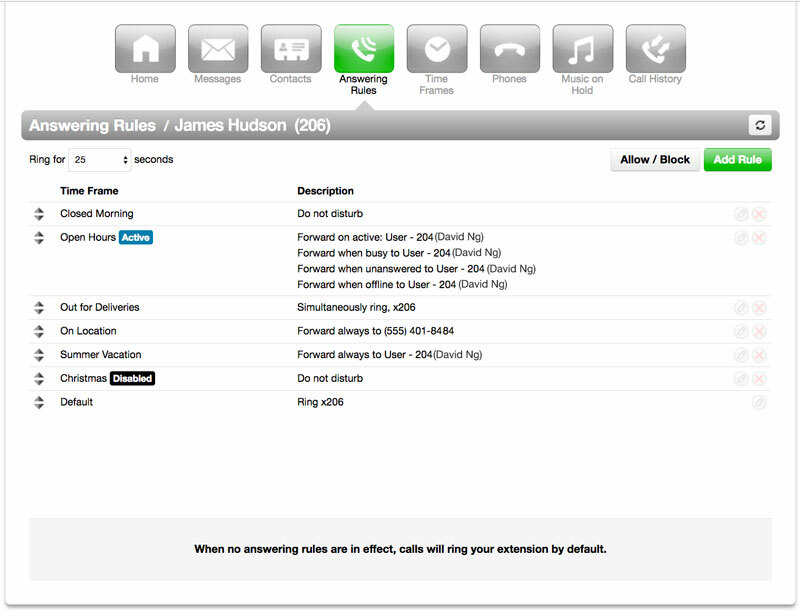 Answering Rules allow you to decide how calls coming directly to your extension are handled. Your System Administrator can set system-wide Answering Rules that you can access, but you can also create your own. Answering rules will help you be more focused, and/or more accessible, depending on your needs. To add, edit or manage rules, click on the Answering Rules icon at the top of the portal window. There you’ll see all the rules currently available. To add a rule, click the “Add Rule” button. The first step in creating an answering rule is selecting a time frame. You can choose from a default list or create your own time-frames. (We’ll cover time-frames in a future post.) You can have many answering rules covering different time frames (weekends, evenings, vacation days and more) and they can all work together. Once you’ve selected a time frame, your rule could be as simple as “Do Not Disturb”. You’ve got a meeting every Monday from 9am to 10am and can’t be interrupted. You’re heading out of town for a week and you don’t want your phone ringing and bothering your co-workers. You work from home and you like to get 6 hours of sleep a night without the phone waking you up. You enjoy office naps from noon to 1pm! Nice! Alternatively, you could turn on “Call Screening”. This requires individuals to provide their name when they call, allowing you to decide whether this is a call you need to answer. If you prefer to have your off-hours to yourself, but still need to be responsive to important work calls, you might turn this option on. Call Screening can be a little off-putting to some callers though, so use with caution. Always: Forward regardless of the status of your phone. If you’ve got a partner who helps you field calls, you may want to forward calls to his or her extension if yours is busy. If you’re in another city, working out of a hotel room, you might forward calls to your hotel room phone. 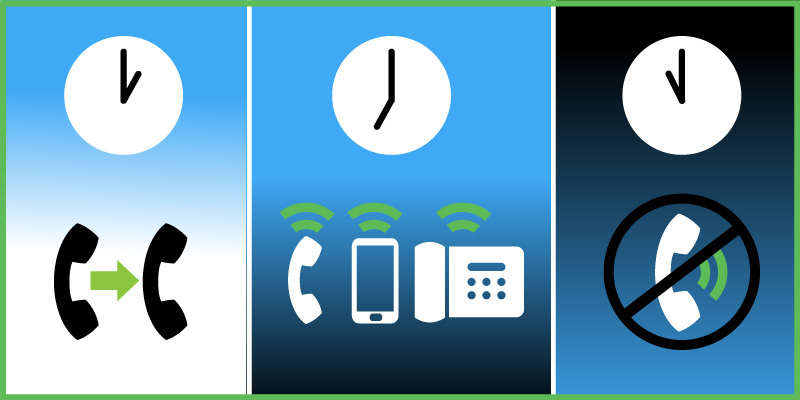 You might forward calls to a conference room phone if you’re team will all be busy in that room for the day. If you have a desk job, but like to stay on top of things in your off hours, create a rule that enables simultaneous ring from 5pm to 10pm, for example. Constantly in-and-out of the office due to your position? Set up a rule to make Simultaneous Ring active during office hours. On-call in a critical role like tech support or emergency response? Then you might use Simultaneous Ring with a 24 hour time frame. Click the “enable” check box in the Add Rule dialogue box to make a rule active. You can also drag rules to change their order, giving one precedent over the other. 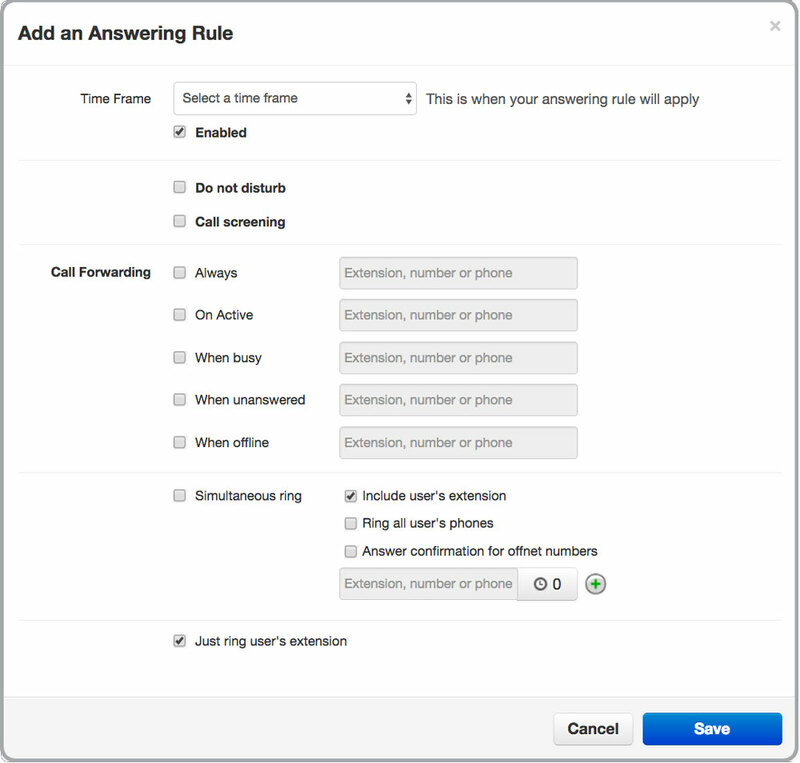 Need some help setting up your answering rules? Contact us today at info@unitedcloud.ca and follow us on twitter, Facebook or LinkedIn.